The first focus area of the Kiwi Coast is the 45,000ha area between Bream Head and Whananaki South and State Highway 1. Two Northland brown kiwi strongholds now exist at Whangarei Heads and Tutukaka thanks to over 10 years hard work by community-led conservation projects in these areas. 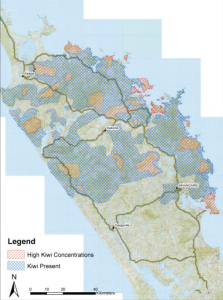 Kiwi and other native wildlife are now spilling out these areas and need safe habitat in which to move, live and thrive. The ultimate extent of the Kiwi Coast will largely be determined by the desire of community-led conservation projects and other landowners to be involved. In time, it is possible that the Kiwi Coast will reach westwards to span the breadth of Northland, as well as extending further north and south along the coast. The Kiwi Coast stretches along the coastline of Northland for approximately 291km, now extending to the southern limit of the Northland Region. Approximately, 130,701ha is under some form of active animal pest control by either individual landowners, groups, projects, hapu, iwi, agencies or organisations. 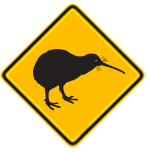 Northland brown kiwi are still found in many parts of the Kiwi Coast, at varying population densities. It is estimated that unmanaged kiwi populations (ie without predator control) decline at a rate of 6% per year (Conning and Miller, 1999. 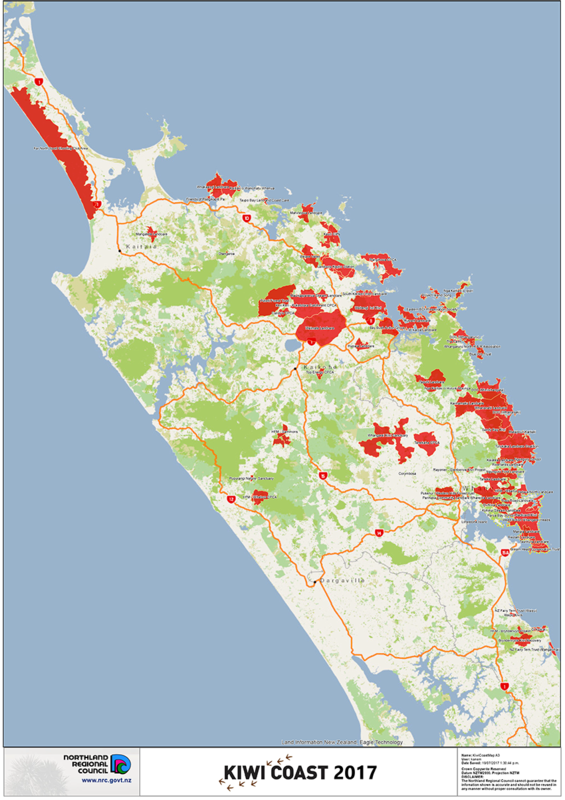 Natural Areas of Kerikeri Ecological District).